"Soliman Bouchuiguir, former president of the Libyan League for Human Rights with symbiotic ties to the National Transitional Council, generated the pack of lies that justified NATO's war allegedly to protect the Libyan population" according to an in-depth analysis by the highly acclaimed Voltaire reporter Mahdi Darius Nazemroaya in his document titled, "Libya: Human rights impostors used to spawn NATO's fraudulent war." "The war against Libya is built on fraud," Nazemroaya states, while Bouchuiguir is now the new Libyan ambassador to Switzerland. Nazemroaya is the Canadian-based sociologist and scholar Research Associate of the Centre for Research on Globalization (CRG) specializing in geopolitical and strategic issues who covered the Libyan crisis from there. He was reporting news stories that concurred with other independent journalists there on the ground, but contrary to what mainstream media was reporting. He remained until he became targeted by "NATO Rebels", as other independent reporters there were and narrowly escaped. 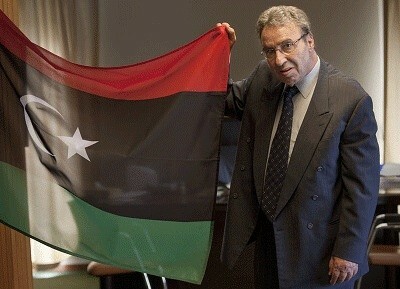 Independent reporter Lizzie Phelan said that most Libyans accurately call the "rebels" there, "NATO Rebels." Resolutions passed against Libya have been based on allegations highly reported by mainstream media such as that Gaddafi lead jet attacks on his own people, engaged in a violent repression against uprising, and killed more than 6000 civilians. "These allegations were spread before they could have been verified," states Nazemroaya, yet they were "the basis that the Lybian Jamahiriya governement was suspended from the United Nations Human Rights Council, before being referred to the United Nations Security Council." One main source for the claim that Gaddafi was killing his own people is an organization, Libyan League for Human Rights that is linked to the International Federation of Human Rights (the FIDH). "On the 21st of February 2011, the General-Secretary of the LLHR, Dr. Soliman Bouchuiguir, initiated a petition in collaboration with the organisation UN Watch and the National Endowment for Democracy. This petition was signed by more than 70 NGOs. "Then a few days later, on the 25th of February, Dr. Soliman Bouchuiguir went to U.N. Human Rights Council in order to expose the allegations concerning the crimes of Gaddafi's government. In July 2011 we went to Geneva to interview Dr. Soliman Bouchuiguir." Bouchuguir's doctoral thesis is widely quoted and used in strategic circles in the United States according to Nazemroaya. "This thesis was published in 1979 as a book, The Use of Oil as a Political Weapon: A Case Study of the 1973 Arab Oil Embargo. The thesis is about the use of oil as an economic weapon by Arabs, but can easily be applied to the Russians, the Iranians, the Venezuelans, and others. It examines economic development and economic warfare and can also be applied to vast regions, including all of Africa. "Bouchuguir's analytical thesis reflects an important line of thinking in Washington, as well as London and Tel Aviv. It is both the embodiment of a pre-existing mentality, which includes U.S. National Security Advisor George F. Kennan's arguments for maintaining a position of disparity through a constant multi-faced war between the U.S. and its allies on one hand and the rest of the world on the other hand. The thesis can be drawn on for preventing the Arabs, or others, from becoming economic powers or threats. In strategic terms, rival economies are pinned as threats and as "weapons." As Nazemroaya notes, "This has serious connotations." One such connotation relates to the United States President having signed an Executive Order ruling against international law that anyone, anywhere, without evidence of criminal activity, can be targeted for killing. Although a U.N. High Commissioner for Human Rights spokesperson warned in August that "summary executions are not permissible in peacetime or in wartime," as reported Aviation News, the controversial targeted individual military kill-list Executive Order signed by President Barack Obama, paved the way for anyone viewed as an obstacle to the United States military agenda of Full Spectrum Dominance to be targeted. Anyone, including personal foes, can and is encouraged to report individuals as a threat. To mainatin data and oversee persecution of those reported Targeted Individuals are 3,984 federal, state and local organizations working on domestic counterterrorism, 934 created since the 2001 attacks according to national security investigative reporter for the Washington Post Dana Priest and Bill Arkin who spent over 2 years investigating top secret practices and related human rights abuses. To kill a target, even low-profile ones such as those on one of the United States "terrorist watch lists" with hundreds of thousands of names, the target is kept under surveillance, a term also called stalking by some Targeted Individuals and most courts of law. Stalking experts agree that stalking is terror. For example, among first words to describe stalking, Crime Victim Services states, "Stalking is a form of terror that 5-20% of women in the US experience." It is also a form of terror that Muamar Gaddafi experienced for months as a Target until his violent death, the same way other extremist stalked targets too often die since they have little or no protection. There is now a call for a complete investigation of Gaddifi's death to formally determine if it was a war crime, as many Targeted Individual survivors who write to Dupré refer to the crime committed against them. Targeted Individuals consistently report ongoing, frequent, "extreme stalking tactics": professional unforced house break-ins, illegal searches, thefts, pet killings, gas-lighting (such as moving personal property while the subject is away or asleep), use of weapons; and use of a variety of tactics. These are the tactics that Psychiatrist stalking specialists, Doctors Emmelkamp and Kamphius, identify as: 1) “extreme stalking” and 2) indicators of future physical violence and lethality. Machon furthered, "And nobody seems to be stepping up to the mark to protect them." Likewise, nobody seems to be stepping up to the mark to protect the hundreds of thousands of other innocent Targeted Individual survivors, not even those who are Americans in the United States.